Hi folks, looks like I will get a chance to check out the CES 2012 show in Las Vegas next week. This is my first time going to this show I'm pretty excited to check out some ultra high-end systems. We will be posting show coverage on the DIY Audio Projects Blog with some some extra show coverage in this thread. Throw a couple pennies at the phools for me, eh? Looks like show will be a lot of fun! Looks like just about everybody who's anybody in audio will be there, I look forward to reading about it. Post subject: Rumors at CES 2012 - Is the CD dead? The show officially kicks off tomorrow but I went down to check out the spread today and to say hi to some friends who are exhibiting. All the exhibitors were busy setting up today but I did manage to find one exhibitor who was ready to display - Lawrence Audio (http://lawrenceaudio.com/) Very nice and unique speakers (nice + unique = expensive). I'll crop the photos and post them shortly. While chatting with some of the exhibitors today, I heard on a few occasions on how high-end CD player sales are way down. One even saying that apparently they can't be given away - of course he didn't offer me one! I'm curious how many others are going down this path? A couple times a year I find myself selling off CDs that I no longer listen to and also those that I have replaced with high-resolution digital media. I don't imagine I will buy another stand alone CD player (or disc based video player for that matter). Instead, I have been investing in DACs, turntables and vinyl accessories. My vinyl collection grows while my CD collection shrinks. So how long before the CD player officially becomes legacy hardware? I got a chance to privately listen to the new Cello speakers by Lawrence Audio. The show officially starts tomorrow and unfortunately large crowds are not too conducive to critical listening so this private listening session today was really nice. 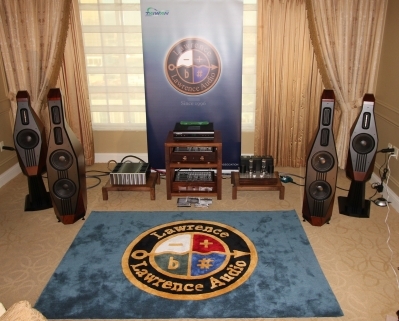 There is a more detailed post on our blog - Cello Speakers by Lawrence Audio at CES 2012. Here is an additional photo of the speaker showing the rear firing Aurum Cantus G2Si ribbon tweeter. I've had a lot of success improving my DIY speakers by adding an inexpensive tweeter firing towards the rear. If you mount the rear tweeter, use a small switch so you can turn it on and off. In some rooms the rear tweeter can really help, especially with single-driver systems. 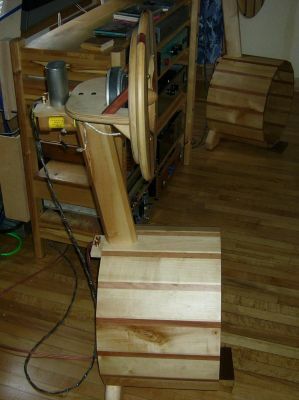 I'll have to try and inclined mounting like that on the Cello speakers. Sorry for the lack of updates folks. Too many late evening events in Vegas to stay focused. The photos below show the Dionysus M-801 speakers from Taiwan. The Dionysus speakers are not currently available in north america so there is no pricing information for them. I probably liked these speakers because of their higher XO point. I really liked this poster of their Oak Cask speakers. Unfortunately the oak cask speakers did not make it to the show due to their physical size. Looks like they would be fun to enjoy your favorite music and beverage with. I remember when I was a kid that my uncles used to go up to the Crown Royal plant in Gimli to buy old oak whisky casks for wine making. I wonder if you can still buy them? 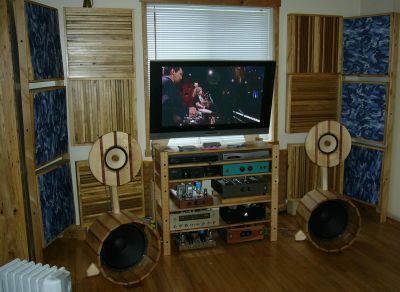 The oak kasks also reminded me of a pair of open baffle speakers built Keith which I really enjoyed. Sorry, I couldn't get a view of the solder joints! Sorry for the lack of posts on CES, I took ill after the trip ad am just starting to fell better. I'll catch up on the CES posts in the next few days.